« Neoliberalism: not so bad? This entry was posted on March 16, 2019 at 10:05 am and is filed under capitalism, economics, marxism, Profitability. You can follow any responses to this entry through the RSS 2.0 feed. You can leave a response, or trackback from your own site. A question: If a non-capitalist state wanted to stimulate non-capitalist economic activity, how would it go about doing that? Printing money for the government to pay workers to produce goods, services and infrastructure would be fine with me, but it wouldn’t address the fundamental problem of the wage system i.e. the social relation of Capital, nor would it be sustainable because the money commodity represents wealth and to the degree that it doesn’t, its only worth the paper it’s printed on, for wealth has two sources: goods and services produced by wage-slaves doing their socially necessary labour time and natural resources. Official inflation has not moved up much more than 2% per annum. In my book though, inflation is measured by prices being higher than they should over value. A lot of the prices of assets are inflated, IMO. For example, housing is way over priced in Australia and this is because the supply of housing is kept down in the face of increasing demand. I’d say the same for insurance and other financial services. Speculative ventures into the market place of commodities create the illusion of value. By increasing the price over value what you have in hand is fictitious capital. There was a lot of fictitious capital inflating asset values before the GFC–e.g. Collateralized Debt Obligations and other parts of the finance sector, including insurance and real estate. Inflation is calculated according to a predetermined “goods basket”. This “basket” is decided by the government, and varies depending on the country. My knowledge over the fact is scarce, but here in Brazil housing is not part of the IPCA (the Brazilian “goods basket”), so it doesn’t affect official inflation. Brazil has a separate index to measure housing prices and rent (and there are many: they vary according to the region). Usually, they are part of the subsistence use value (essential food, water, electricity etc.). Some products are not in the calculus directly, but they influence inflation indirectly. E.g. fuel (which tends to affect prices of transport of goods which are in the inflation calculus). So, yes, there is a domino effect of some kind. You have to go to your country’s government website and see what products are part of your “basket”. My guess is housing/rent is also not part of the Australian inflation index. And financial services for sure don’t enter in the inflation calculus. It simply wouldn’t make sense for a capitalist government to do so. I know here in Brazil we have at least separate index to measure credit cost to the “consumer” (i.e. the working class). Right. Lots of commodities with inflated prices are not included in the official rate of inflation. Still, the prices are inflated over value and that includes real estate, which in Australia, is way inflated, but contributes to what the government measures as the GDP. Thus, the GDP is full of a lot of fictitious capital. The credit system constitutes the transition to a new mode of production. “Prophet” is actually a compliment! We agree on the problem of fictitious capital, i.e. capitalisation of future income streams. (But this has nothing to do with bubbles!) If the interest rate is lower than the growth rate, assets in limited supply (who provide a positive rental income) can just like states sustain ever growing debt burdens. But this problem is not specifically Marxist. Every bourgeois economist including Smith and Ricardo would agree that rent seeking is bad, a form of private taxation. The best remedy is to tax these rents away. Our disagreement lies in the following inconsistency in your implicit model. Forget about rent, imagine there is only money capital, real capital and workers. What you can’t explain is, how can capitalists go into a capital strike the moment the profit/interest rate reaches zero, but not use this magic ability to stop the profit rate from falling in the first place??? Marx had a good answer: under a gold standard zero is the limit, why investing, if you can hoard your money capital. But Marxists today can’t answer in this way, cause there is no gold standard. We actually operate under John Law’s paper money! So we could enact negative interest rate (and/or higher inflation). If we would do that, why shouldn’t this allow us to operate without positive profits? I’m not talking politics here. I’m interested in an economic argument why this can’t work. Alex, marxist’s don’t analyze capitalism’s problems from within political economy’s idealized (strictly economic) version of the capitalism’s mode of production, but from one (historical materialism) which reflects capital’s social relation and its political manifestations. I’d be interested in Robert’s response to your question, but I think it is already answered in the quote from Joan Robinson (her ironic advice to capitalist reformers in power) at the end of his post. I understand that. But it’s nevertheless important to distinguish between economics and politics. If someone -in an economy with no output gap- would advocate making everyone richer by doubling the amount of money everyone holds (including doubling debt and long term nominal contracts…) nothing real would have changed, only prices would double. This is not a political problem. Nothing would change, because nominal values are not real values. In this case printing money is like painting food, the amount of food doesn’t rise by painting pictures of it, a picture of an apple won’t feed anyone. Things change if you don’t believe Say’s law has it right. If -in a monetary economy in contrast to a barter economy- there is no full employment equilibrium, then money matters. Think about it: how do Marxists explain that in a crisis conditions of profitability get restored? Either by the outright destruction of physical capital or in a deflationary crisis the price of capital goods crashes, so that money capitalists can buy them up cheap. The rate of return on these capital goods rises if I can get them for a fraction of their former price. Now, a negative interest rate (or inflation) has the same effect. New real capital can now be produced at much lower prices than in the past. This raises its rate of return. So productive investment can be realized, even if the rate of return is zero or negative, so long the rate of return on money capital is even more negative. Positive profitability is no longer a condition for productive investment. 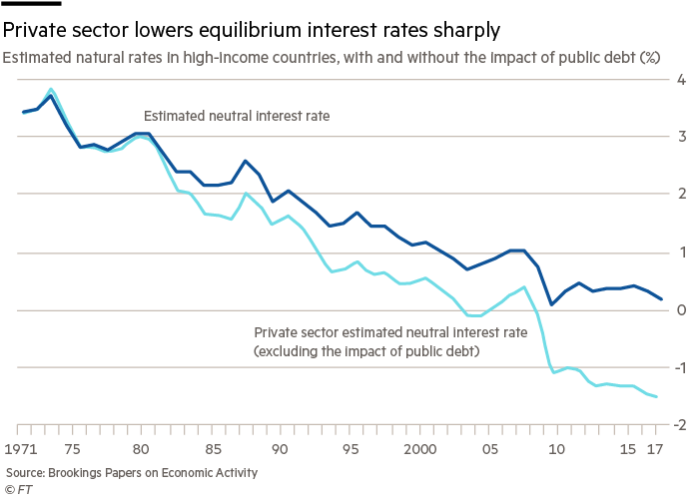 In a way, negative interest rates are like a crisis, but only a crisis for money capital (but this causes also lower price of real capital). They restore conditions of differential profitability (not positive profitability). Capitalists don’t make positive profits, but they lose less by investing than not investing. Except that rent is essential to the survival of capitalism, even if, depending on you moral set, it is a “necessary evil”: it keeps land (space) in the commodity form and thus in constant circulation. Imagine if land could be definitely sold, like if it was a normal good. A person could buy a piece of land and never sell it. But that would be a huge problem to capitalism, because capitalism can’t produce space (it can occupy new space, but not create it in the physical, quantum sense of the word). Assume a city transits from industry to services due to the complicated process of gentrification. Capital would need to use the space once occupied by factories to build cafés, shopping centers etc etc. But what if the owner of the land doesn’t want to sell it? Capital would be unable to do “creative destruction” because of a mere juridic serendipity. And, since space is always useful, the owner could always simply choose to go back to feudalism, re-cultivating the land — unacceptable to capitalism. The owner of the land will most probably choose to rent it: he will collect rent (money-capital without the having to invest) in exchange to the promise to the capitalist system (to “society”) that he will always leave his land at the services of capitalist accumulation — he’ll rent to the highest bidder, who will invariably have the highest profit rate. It’s that or capitalism would have frequent civil unrest, for each time it would have to substitute a factory with an ice cream shop. That’s why every capitalist country in the world — even the USA — has a land tax. The owner of the land must always demonstrate to the State he is capable to give his land to “good use”; in capitalism the sincerest proof of love is money, hence land tax must be paid in the form of a certain quantity of it. That’s one of the main factor that makes China a socialist country: a private individual can never own land there (except in Hong Kong and Taiwan, which are capitalist; and some land that belonged to some peasants before the revolution in some cities). When you “buy” a estate in China, you’re actually purchasing a 70 year lease. That makes land not inheritable (inheritance is the conditio sine qua non of private property). All land in the socialist part of China is “property” of the State, and, therefore, of all the Chinese proletariat. I have no problem with a land tax. On the contrary, forcing landowners to use their land in the most productive way is a good thing. My problem is this: when profits/interest rates go to zero, capital values of every asset which still has a positive income stream and can’t be produced (land is the foremost example, you can’t raise supply and there is always demand, people have to live somewhere) will rise sky high. What is often called asset price inflation or bubble, is just a very rational investment strategy in a low interest environment. This creates the illusion of wealth (fictitious capital) and is clearly inferior to investments which raise productivity (education, technology, infrastructure…). To stop this, the underlying income stream has to be taxed away (and redistributed in form of a workers dividend or through public investment). By doing this the capital value of these assets implodes, making the way free for productive investments. Rent still has to be paid, but not to the asset owner who therefore can’t capitalize this rent. Buying up land just for speculation wouldn’t fly anymore, because holding land with very high site value would become very costly. Think of it like a permanent auction with the highest bidder getting the right to occupy the land as long as he can outbid everybody else. All proceeds go to the community. Actually, when the price of gold was under that government set standard, that an ounce was worth $36 an ounce, it was the price of the USD which was out of kilter with its value as a commodity. The USD had been inflated in price over its real value and the ruling classes of OPEC knew it, which is why they demanded to be paid in gold. When Nixon closed the gold window to Fort Knox and declared himself a Keynesian, he allowed the dollar to float in the marketplace of commodities and its price then more or less reflected its value as a commodity. What’s the price of gold now as measured in the money commodity known as the USD? If supply doesn’t change (unemployed workers can’t be hired to produce oil) and demand doesn’t change either, inflating your currency will only produce price inflation. You can’t get oil cheaper by printing money. I agree. But from a Marxist (and bourgeoisie) perspective income from the ownership of land, oil, gas… are forms of rent. Ideally rents should be taxed away. There should be no privat ownership of assets which provide rental income. The Alaska permanent fund is a good way to do it. My difference with Michael Roberts turns on real capital: assets that can be produced by workers. If the aim was to avoid deflation then in this sense they were successful. I’m tempted to repeat the comment of left Keynesian Joan Robinson to MMT/Keynesians: “Any government which had both the power and will to remedy the major defects of the capitalist system would have the will and power to abolish it altogether”. I see. Is this why you argue that China is run along non capitalist lines? Don’t you think that emedying the defects of a capitalist system has been the role of the government – expansion overseas, investment for war (non profitable for the losing side), and the permanent war economy of the Cold War. In the MMT writings that I have read, Japan is used an example of how the hysteria about the horrors of elevated public debt makes not sense, not like an example to follow. I have not read any MMT economist that support monetary policy instead of fiscal policy as you suggest. Do you have any link? Yes, MMTers do not think monetary easing will work – like Keynes. But they do think fiscal deficits will work – like Keynes. Both policy solutions do not provide any permanent or even significant counteracting influence to regular and recurring slumps in capitalist accumulation and production. MMters, like Keynes, see budget deficits as backstops to capital failure. 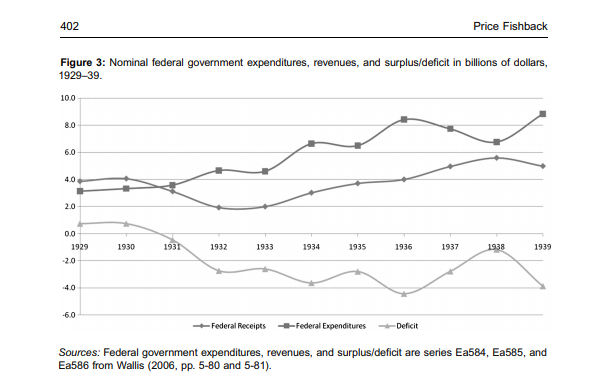 I reckon both theory and evidence show fiscal stimulua to be inadequate and even counter productive. Thanks for your answer. I admit I have some problems understanding your position (my fault, I’m not an economist). I would be grateful for some clarification. I have read in your blog that the great depression only finished with the Second World War big spending. That was a (very big) fiscal stimulus and the government didn’t run out of money, just as MMT propose. Are you saying that a similar fiscal stimulus would be politicaly impossible in peace times? Or that something fundamental have changed and not even a so big stimulus would do the trick? Or, maybe, something else that I don’t realize? Good questions. In WW2, the difference was both political and economic. All the resources of the economy were diverted to the war effort and the government took control of all investment decisions. Companies had to invest and produce for the war effort. And workers incomes were controlled and consumption reduced (rationed), so household savings were diverted to arms production. Profitability rocketed. In effect, the capitalist sector no longer operated for its own ends (even though industrial sector made big profits from arms production). This was only politically possible because of the war (as Keynes noted) BUT it was also qualitatively different economically from Keynesian-style fiscal stimulus from budget deficits where the capitalist sector still makes the main investment decisions on the basis of profitability. That did not work in the 1930s or in the period post-2009. A war economy might work but that would not be a capitalist economy but a state-directed and controlled economy. Thanks again for your answer and your patience. If I understand correctly, you agree with MMT, that the government, as they say, “can always afford to buy anything for sale in its own currency” and, as the WW2 example show us, that could make the economy work. Your problem with this is that, for this to work, the majority of the investment should be controlled by the government and that would be politically impossible to accomplish because, it represents a change from capitalistic economy to a state-directed economy. I hope I get it right. More or less. The problem that I have with MMT is that just controlling the currency and printing money will not create value (ie profit for the capitalist sector). As the capitalist sector is dominant, more money printing and permanent budget deficits may just boost financial speculation and/or inflation. MMTers say it wont because the government could stop printing money when full employment is achieved. That’s not so easy to manage as experience has shown. More important, recurring crises of unemployment and underinvestment are not resolved by MMT policy as that depends on the profitability of capital. So MMT acts only as an (inadequate) backstop to capitalist failure (recessions). MMT then is not a complement to socialism but a weak alternative. So it is no different than orthodox Keynesian policies. Quick question related to historic low interest rates. If the cost of borrowing is extremely low would that at least have some impact on potential profitability of a capital investment? Simple question: Why do you think Martin Wolf is a Keynesian? I know he is much more skeptical of free markets and globalisation since 2007 (much to his credit I think) but he did not describe himself as a Keynesian in his biographical sketch to his 2004 book (I have not read his later one). Indeed, he was avowedly anti-Keynesian.